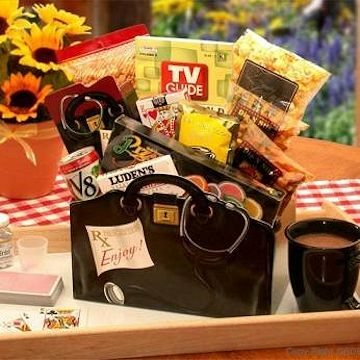 A Prescription to Get Well Gift Box. Send them a get well prescription! This traditional Dr's Medical bag carries everything they'll need to cure what ails them lickity split. Overflowing with delicious treats we've also included a fun word search and a deck of playing cards to help pass the time. This gift includes the following: Rx Gift Box, Rx Theme Box Filled w/ Choc Chip Cookies, Get Well Soon Gourmet Coffee, Super Word Search Puzzle Book, 2 oz Cheddar Cheese Pretzels, 2 oz Garlic & Onion Pretzel Twists, 1.5 oz White Cheddar Popcorn, Pizzazz Fruit Slices, Deck of Playing Cards, V-8 Vegetable Juice, Luden's Cherry Throat & Cough Drops, 5 oz Vanilla & Cinnamon Caramel Corn.